This salad is perfect for breakfast on a hot morning, a side dish for lunch or dinner, a picnic, a barbecue … It pairs well with fish, chicken, steak, or burgers. The recipe below is just a starting point. You can use any type of melon, play around with the ratio of melon to grapefruit and oranges and use an endless array of garnishes. 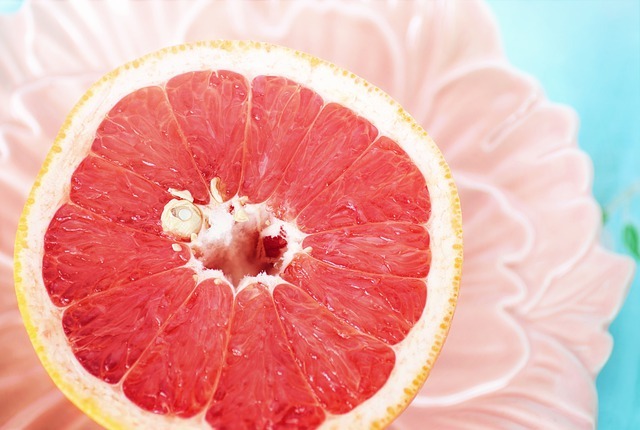 If you don’t like grapefruit you can use pineapple or grapes instead. Breakfast and lunch – ready to hit the road. Sometimes I get tired of protein powder shakes, add ice cubes and some water, blend, yawn. So I start playing around with the basic recipe and suddenly my mornings are a lot more interesting. I’m using stevia as a sweetener but you can use monk fruit, Splenda, or any other healthy sweetener. To your chosen protein powder recipe add 1/2 cup frozen or fresh strawberries and 1 tablespoon ground flax seed. If all you have is whole flax seed add them by themselves in the blender and process until ground, then add the remaining ingredients. To your chosen protein powder recipe add 1 & 1/2 cups unsweetened nondairy milk, 1/2 banana, 1 tablespoon cocoa powder, 1/4 cup cold coffee, 1 teaspoon stevia. To your chosen protein powder recipe add 1 & 1/2 cups unsweetened nondairy milk, 1 cup spinach leaves, 1/2 pear or apple, 1 teaspoon stevia. To your chosen protein powder recipe add 1 & 1/2 cups unsweetened nondairy milk, 1/2 pear or apple, 1/2 banana (optional), 1 teaspoon ground ginger, 1 teaspoon stevia. To your chosen protein powder recipe add 1 & 1/2 cup unsweetened nondair milk, 1 tablespoon cocoa powder, 1/4 cup cold coffee, 1 teaspoon stevia. To your chosen protein powder recipe add 1 & 1/2 cups unsweetened nondairy milk, 1 cup chopped pineapple, 1 teaspoon stevia. To your chosen protein powder recipe add 1 & 1/2 cups unsweetened nondairy milk, 1 teaspoon ground cinnamon, 1/2 teaspoon vanilla extract, 1 teaspoon stevia. 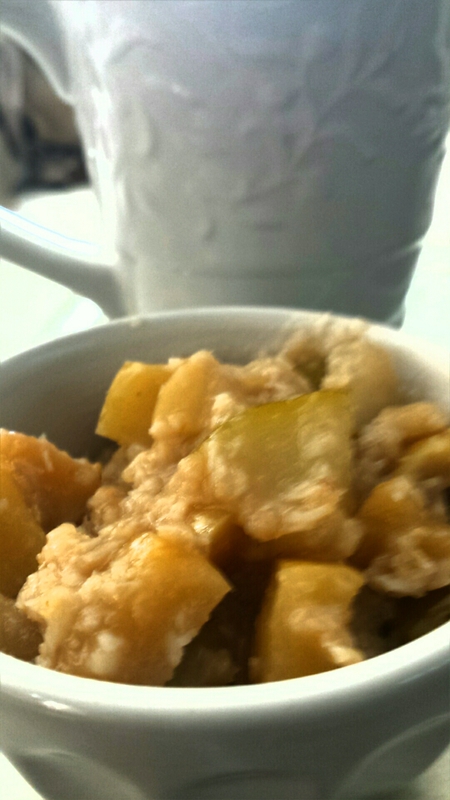 This is a very versatile recipe for a hot breakfast on a cold day or a light dessert. I used apples and pears because that’s what I had on hand, but you could use only apples or only pears or any combination of the two as long as it equals 6 pieces of fruit. To be honest with you I don’t always peel my fruit, especially when not cooking for company, but this recipe does taste better if you remove the peel and if you’re serving it to children you’ll find they’ll like it better without the peel. The peel is extra chewy and slightly bitter. Since I don’t like to waste food I save the peels to add to smoothies. P.S. You could use chia seeds instead of the oatmeal – your colon will thank you tomorrow! Peel and core the fruit. Set aside the peels to use in a smoothie for another day. Chop fruit into approximately 1/2 inch cubes. Place in saucepan over medium low heat. Add remaining ingredients. Cover and cook for 20 to 30 minutes until your compote is the consistency you desire. Place ingredients in a blender – a food processor won’t give you a smooth puree, an immersion blender will work, but not as easy as a counter top blender. 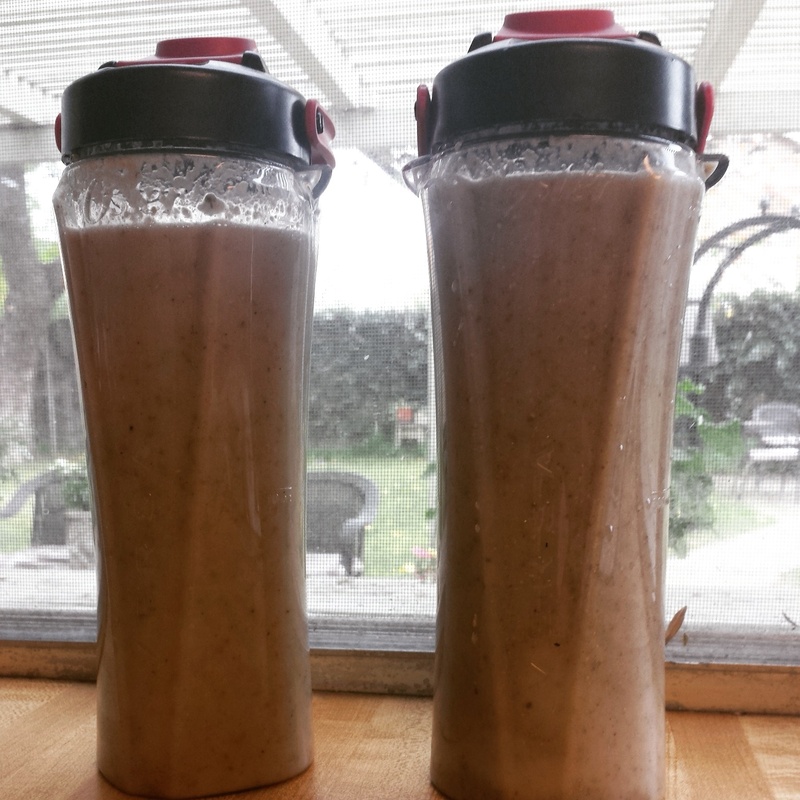 I prefer this shake made with dates, almond extract and orange juice, and no rum extract. But that’s me, you may love it without dates and with rum extract. When I make this drink for guests I make it how I like it, and pour it into glasses for some of my guests. Then I add the rum extract for the rest of my guests, and viola! everybody’s happy. These fruit concoctions can be eaten for breakfast, lunch, dinner, snacks, some are even grown up enough to be served at your next party. Remember though that they still need to be eaten before, with, or just after a meal, or wait 4-1/2 hours after a Protein meal, 2-12 hours after a Starch meal. I prefer using toasted pecans, but raw will do just fine also. On a cold winter night I sometimes use this applesauce in place of a salad for dinner. If the applesauce is too runny let it sit a bit to give the nuts a chance to soak up some of the liquid. Here is an excellent tasting recipe from Anne Louise Gittleman’s “Get The Sugar Out.” This won’t taste exactly the same as a baked apple pie, but it’s delicious and well worth giving it a try. When it’s a chilly morning, I love this for breakfast, barely warmed with a little cream or nondairy milk poured over the pie. M-m-m good! In a food processor pulse 3 cups walnuts or pecans to a fine powder, so that you have 2 cups of ground walnuts. Take care not to end up with nut butter. If you need to add more nuts, do so. Dump out into a 9-inch pie pan. Pulse 3/4 pound dried dates, pitted and chopped in food processor. Dump nuts back into food processor and pulse until well mixed. Pat dough into pie pan so that it forms a crust on the bottom and up the sides of pan. Chill overnight. Soak 3 large apples, peeled, cored, quartered, and sliced into 1/4 inch pieces in juice of 1-1/2 lemons (about 1/4 cup) and 1 teaspoon cinnamon, overnight. The next day, pour into crust. Toss your choice of Fruit with a modest amount of this syrup. Variations: use thyme, or rosemary in place of the mint. This salsa is great over fish or chicken or as a topping for Chili Relleno Crepes. I filled a soy cheese and whole wheat tortilla quesadilla with this salsa the other night and WOW! If you use Nutrasweet or Sweet ‘N Low in place of the unrefined sugar then this is a zero calorie food. Cover and refrigerate overnight. Just before serving, add 1/4 cup sliced green onion, both white and green portions. This salad is surprisingly delicious. I came up with it when I was in the mood for a Waldorf Salad, only it wouldn’t have gone with the meal I was serving. The mild sweetness of the pears stands up to the sharpness of the blue cheese and the bite of the black peppercorns. Serve on a bed of lettuce dressed with Blue Cheese Vinaigrette. Garnish with crushed black peppercorns and fresh or dried oregano, sage, or rosemary. Puree 2 apples, peeled and cored and 1 banana. Stop and scrape as needed until you have a smooth puree. If you use Nutrasweet or Sweet ‘N Low in place of the unrefined sugar than this is a zero calorie food. Gently fold in 5 peaches, sliced or cubed. Gently heat the peaches just until warm. Substitute 1/2 cup UnDiet Whipped Cream for the heavy cream. Substitute pears or apples for the peaches. Stir continuously over medium heat until sugar melts 2 teaspoons butter and 1 tablespoon unrefined sugar. Substitute 1 sliced banana for one apple. To keep the banana from turning brown soak in fresh lemon or lime juice before adding to the apple. Use as a topping for Cinnamon Banana Pudding , Cocoa Banana Pudding, or Creamy Orange Gelatin. This is enough dip for 4 cups of strawberries. Variation: spoon sauce over or use as a dip for blueberries, raspberries, boysenberries, peaches, bananas or a mix of these Fruits. If you skip the feta cheese then this is a zero calorie dish. Mix 1/3 cup lime juice, 2/3 orange juice, a dash of chili powder, and a dash of hot sauce. Add 2 cups pineapple, diced, 2 cups cucumber, diced, and 2 cups mango, diced. Spoon into 4 tall glasses or bowls. Top each serving with a sprinkle of crumbled feta cheese and/or minced chives. Absolutely a zero calorie dish. That’s it. The whole recipe is in the title. Freeze the grapes. Your kids and teenagers won’t care that they’re healthy – they’ll eat them like ice cream! Substitute your choice of liqueur in place of the vanilla. Stir 2 tablespoons cocoa powder into the cream when you place the bowl and beaters in the fridge. Whip with rest of ingredients when ready. Mix together the following ingrediets. Cover, and refrigerate for forty eight hours. Stir a few times during this period. The longer you leave it, the thicker the “yogurt” becomes. Spoon cottage cheese mixture into a cheesecloth lined colander. Place this assembly over another container to catch the liquid that will drain off from the paska. Refrigerate overnight. The paska can be made several days in advance. It will get firmer the longer you allow it to drain. Gently toss the ingredients below and refrigerate several hours or overnight. Place a scoop of the paska in the middle of a bowl and circle it with the berries and their juices. You can either serve this on a big platter or make individual paskas with berries. Desserts can often be a tricky area when living a healthy lifestyle. Luckily, there are many desserts that call for natural ingredients that can actually provide health benefits to your diet and can work with your plan on how to lose weight fast through nutrition. One of my favorite desserts involves using papaya, mango, pineapple, a little coconut milk and some pistachios. Because of its ingredients, this dessert is not only a healthy option but is also gluten free and can be eaten by people who suffer from diabetes (depending on their current blood sugar levels). This dessert tastes delicious and is high in vitamin C, fiber and beta-carotene. Plus, it is quick and easy to make. The first thing to do is slice up a ripe pineapple, mango or papaya. You can mix up a combination of the fruit or choose just one. Place the slices into a bowl or on a serving platter. Next, you will drizzle coconut milk (or lite coconut milk) on top of the fruit. For about every 16 slices of fruit, you should use approximately 4 teaspoons of coconut milk. Lastly, add about 2 tablespoons of pistachios. Most people like when the pistachios are chopped up into smaller pieces, but chopping or not chopping is up to your personal preference. If you are short on time, the dessert can be eaten immediately. However, if it is a hot day it is usually better to pop it back into the fridge for 10-15 minutes to make it cooler before eating. This is also a good recipe to serve to kids on a hot day instead of popsicles. Just prepare the fruit and coconut milk and stick it into the freezer for about 2 hours. You can add the pistachios when your kids are ready to eat or leave them off for your picky eater. If you are adding the pistachios, I have found that slightly mashing the fruit up inside of a bowl makes it easier for the kids to eat the fruit and pistachios at the same time. For more health and fitness tips, visit Know My Body. Cool, clean, sometimes creamy and rich, sometimes bursting with fresh Fruit, gelatin desserts make my mouth water just thinking about them! And the beautiful thing is that I can have a rich and creamy dessert that is low calorie, high protein, low carb, low fat, Atkins compliant, in The Zone, Somersized … name your diet plan and jello will most likely be acceptable. I prefer not to use sugar-free gelatin because it’s sweetened with aspartame. Aspartame has a strange effect on many people, completely halting weight loss. Don’t worry, it’s not permanent. It usually only lasts for the day that you’ve eaten aspartame. But since I don’t like to sabotouge a day of dieting, I prefer to use plain gelatin and flavor it with various items. If however, you don’t want to bother, you can always substitute sugar-free fruit flavored gelatin in the recipes below. Note: If you use agar-agar or a soy based gelatin instead of gelatin then these recipes will be Neutral or vegan instead of high protein recipes. If you’re having trouble getting your children (or DH) to eat fruit, this is an easy way to sneak it in. Dissolve 1 packet unflavored gelatin by sprinkling it over 1 tablespoon cold water in the same container that you’ll be serving from or storing your jello in. Then stir in 3 tablespoons boiling water. When the gelatin is dissolved stir in fruit puree. Cover and refrigerate until firm. Dissolve 1 packet unflavored gelatin by sprinkling it over 1 tablespoon cold water in the same container that you’ll be serving from or storing your jello in. Then stir in 3 tablespoons boiling water. When the gelatin is dissolved stir in 3 cups water and enough of your favorite sugar free drink powder to flavor 3 cups of water. Cover and refrigerate until firm. This is such a brilliant way to enjoy a cold treat on a hot day without the mess of sticky juice running down your hand. Make up a batch of Basic Jello or Basic Creamy Jello according to the directions above. Pour into popsicle molds and freeze. Mash 1 to 2 bananas and stir into the Basic Jello or Basic Creamy Jello recipe, adjusting the liquid so that the total amount of jello is 3 cups. Pour puree into a saucepan. Sprinkle 1 envelope unflavored gelatin over the puree. Stir over medium heat until gelatin is dissolved, 2-4 minutes. Pour into dishes. Chill until set. Make up 1 batch of Basic Jello. Pour 1/2 of it into a serving container and refrigerate. Set aside the other 1/2 of the recipe on the kitchen counter, do not refrigerate it. When the refrigerated jello is semi-firm, stir in 1 cup of your choice of fruit. Place back in refrigerator while making up 1 batch Creamy Jello. Pour 1/2 the Creamy Jello into the serving container. Refrigerate until this layer is semi-firm. Pour remaining 1/2 of the Basic Jello over the Creamy Jello. If the Basic Jello is not liquid enough to pour, gently reheat it in the microwave for 10 to 20 seconds or over a double boiler. When this layer is semi-firm pour the remaining half of the Creamy Jello over it. Refrigerate until firm. UnDiet Whipped Cream: Whip heavy cream flavored with vanilla extract and sweetened with honey, agave nectar or unrefined sugar until stiff peaks form. Creamy Dip:: Whip 1 cup creme fraiche or heavy cream that’s been whipped into soft peaks together with 1 teaspoon grated orange peel, 1 teaspoon fresh orange juice and 1/2 cup date or maple sugar. Place sliced apples in a (well buttered) pie tin. Sprinkle with a handful of unrefined sugar or any UnDiet-approved sweetener and (cinnamon, apple pie spice, pumpkin pie spice …). Bake for 20-30 minutes until apples are soft. Roughly mash with a potato masher or fork right in the pie tin. Scoop out the middle of one or more whole wheat bagels. Toast and butter. Or use thick slices of whole grain bread, or English muffins. You could also use whole wheat pitas or whole wheat tortillas. Heat and butter the inside of the pitas before stuffing with the cooked apples. Heat and butter the tortilla before rolling up around the cooked apples. Pile the apple mixture on top of your bread of choice.